Asus ZenFone Zoom S is priced at Rs26,999. A lot a users rely on their smartphone camera when it comes to taking photos for Facebook or Instagram posts. Camera quality has improved a lot in phones off late, but there are still many limitations. The most common one is the inability to capture far-off objects in landscape shots. In order to address it, Samsung came up with Galaxy Zoom and Asus introduced the ZenFone Zoom. Now Asus has added another smartphone in the Zoom series. 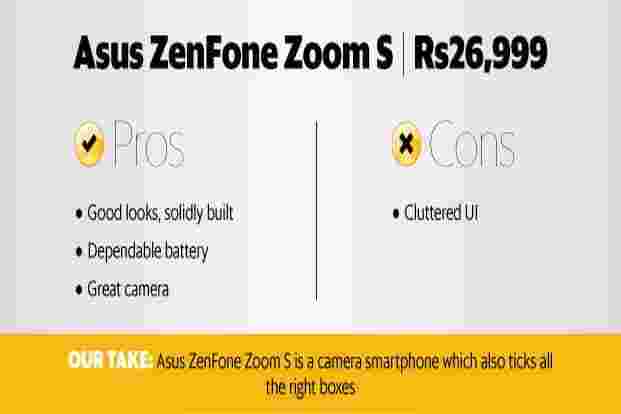 Priced at Rs26,999, the new ZenFone Zoom S is available on Flipkart.com and is competing with Honor 8 Pro (Rs29,999). The key talking point of the ZenFone Zoom S is the two 12-megapixel cameras. The key talking point of the ZenFone Zoom S is the two 12-megapixel cameras. The main camera is powered by Sony IMX 362 sensors and has an aperture of f/1.7. The second camera offers 12x zoom and 2.3x optical zoom, which is rare even in the premium segment—Apple iPhone 7 Plus offers 2x optical zoom and the OnePlus 5 has 1.6x optical zoom. The camera also supports optical image stabilisation, which means you get steady and clear shots even when optical zoom lens is involved. The amount of detail it can pull out in landscape shots taken with 2.3x optical zoom lens is impressive. Colours look rich and stand out from each other in close-ups. Even in low light, images look a lot clear and vibrant than what most mid-range smartphone cameras offer. You can save images in RAW file format and record 4K videos. The 13-megapixel front camera is powered by Sony IMX 214 sensor and can click sharp-looking selfies if the lighting is good. The Honor 8 Pro comes with two 12-megapixel cameras but has an aperture of f/2.2 and doesn’t have optical image stabilisation. The ZenFone Zoom S has an aluminium exterior with sandblasted texture, which feels more reassuring in hand than phones with glass or plastic back. The ZenFone Zoom S is surprisingly slim and nothing like its predecessor, the ZenFone Zoom. It has an aluminium exterior with sandblasted texture, which feels more reassuring in hand than phones with glass or plastic back. It is 7.9mm thick and weighs 170g, which is impressive for a big screen and big-battery smartphone. The Honor 8 Pro is thinner at 7mm but weighs 184g. The fingerprint sensor is placed on the back, which makes it easily accessible. It is quite accurate and fast to use. You can also use it as the camera button to open the camera and even click a photo. This makes up for the absence of a dedicated camera button on the phone. The speaker is well placed at the base next to the USB Type-C connector so the audio won’t get muffled when the phone is placed on a table or bed. Overall, ZenFone Zoom S is a good-looking mid-segment smartphone which snuggles comfortably into hands. It comes in black and gold colour options. Asus ZenFone Zoom S has a bright looking dispaly. The 5.5-inch AMOLED display has a resolution of 1,920x1,080p. It is a bright looking display. Text in ebooks and webpages look crisp, while colours look vibrant without feeling oversaturated or unrealistic. This makes watching movies and gaming an enjoyable experience. Visibility under outdoor sunlight is pretty impressive too. The Honor 8 Pro has a slight edge as it offers a bigger 5.7-inch screen with a higher resolution of 2,560x1,440p and there is a difference of just Rs3,000 between the two smartphones. Asus has added a number of colour customisation options and they actually deliver on the promises. The screen mode can enhance colours in videos and games, while the blue light filter gives the screen a warm tone, resulting in less stress on the eyes. The other highlight of the screen is the Gorilla glass 5, which is supposed to be more rugged than the Gorilla glass 3 used on Honor 8 Pro. Asus ZenFone Zoom S runs Android 7.1 with a heavily bloated Zen UI which looks a bit complex and overwhelming. The smartphone runs Android 7.1 with a heavily bloated Zen UI which looks a bit complex and overwhelming. There are too many third-party apps which you may never use. For mainstream users who like to fiddle with the phone’s look and feel, it has a lot to offer. Users can apply new themes, modify app icon size, adjust grid size, lock apps to the home screen and switch between two-layer mode (app drawer mode like plain Android) and the single layer mode. Honor 8 Pro runs Android 7.1 too but with a less clunky Emotion UI which covers all the basic customisation options. The ZenFone Zoom S is powered by Qualcomm Snapdragon 625 octa-core processor with 4GB RAM. It is a powerful chipset known for its power efficiency and has been used in a number of popular smartphones such as Xiaomi Redmi Note 4, Moto XZ Play and Asus ZenFone 3. It is not buttery smooth, like the Honor 8, but is quite capable of handling multi-tasking, HD movies and heavy games such as FIFA 16 and Real Racing 3. Internal storage stands at 64GB with the option to add 2TB more via microSD card. The only caveat is the hybrid SIM tray which accepts two SIM cards or one SIM card and a microSD at a time. Despite the bloated UI, the 5,000mAh battery was able to squeeze one and half days of backup on modest use. The Honor 8 Pro is powered by an equally powerful Kirin 960 octa-core processor but paired with 6GB RAM. It offers 128GB internal storage, supports microSD cards and packs in a 4,000mAh battery. The Asus ZenFone Zoom S is the best camera smartphone you can buy under Rs30,000 right now. It also impresses with its performance, battery backup, and good looks. However, the Honor 8 Pro trumps it in terms of the bigger and richer display as well as a more powerful processor that could also be more future-proof.